Home > Marriage > Has an affair put your marriage at risk? The discovery of an affair is typically by accident, but that is not to say that your antennae wasn’t up in the first place. I’ve compiled a list of the 4 signs that your marriage is at risk. You may have recently discovered that your partner has been or has had an affair. There may have been some unexplained absences in the past accompanied by any number of other behavior patterns such as more emotional, physical or intellectual withdrawal from your partner. Your intimate/romantic life may have slowed down or come to a complete standstill. But when more tangible evidence surfaces it really hits home at a deeper level as now you have proof that explains the behavior patterns you have been experiencing. You may have even heard from your partner that you are imagining things, that you are too suspicious. Your partner may have even become indignant about you questioning their whereabouts or character adding insult to injury. 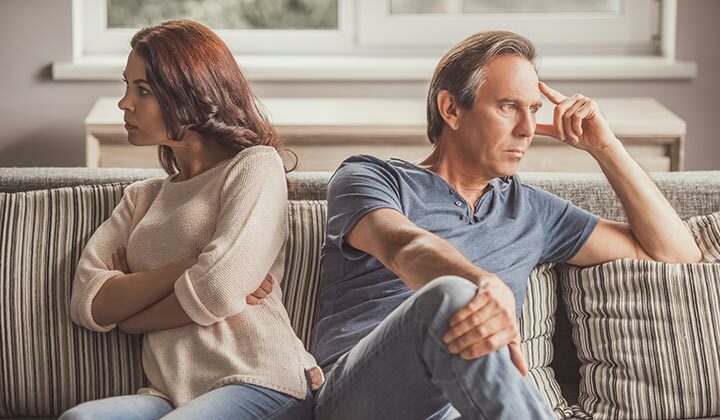 On a very difficult and prickly topic, like infidelity, it is easy to end up with angry outbursts from either spouse as you are talking about something that threatens the very fabric of your current and future relationship. For the partner just learning about the affair, it can feel like their entire sense of reality has been overturned. So likely you have hit a standoff where talking about the affair is unproductive. It is very difficult to generate objectivity when you both have something at stake; the affair person is perhaps still trying to protect the affair or not ready to stop seeing the other person and if you are on the receiving end, you are overwhelmed with anxiety, anger, and hurt. You could find yourself checking the affair partner’s cell phone, or computer. Looking for revealing messages, or double checking credit card statements for unusual expenses like dinners out or gift items. You can develop an almost insatiable need to find out the truth in order to make sense out of what has happened. Some resort to tracking devices, both on their partner’s phone or automobile, in an attempt to discover their partner’s actions and whereabouts. This is the question now being asked, but not always vocalized. In other words if you are just learning about a possible affair, your sense of reality changed and now you do not trust any actions and words from your partner. A new dynamic has started now, whereby doubt and suspicion has replaced trust and predictability. You may find yourself in conversations that threaten to end the marriage. It can often begin to feel like you are in a cold war with your partner. The only conversations you seem to be having are about maintenance issues around meals, or household items, and when you do talk about the relationship it seems they are filled with threats about ending the marriage. The threats can come from either side, but most often, from the one discovering the affair. The affair person may have no intention of leaving their marital partner and may have been trying to keep both people in their life as unrealistic as that is. However it is also possible the affair person had seriously thought of leaving the marriage and as a result they to threaten to leave as well. These threats that although are normal in this context, just keep the feeling of hopelessness alive. You may feel, or be made to feel at cause for the affair. Subtle comments from your partner like “you weren’t loving them enough”, or perhaps they claim a lack of sexual intimacy, you were complaining too much, etc. may come up. So now you have not only been hurt and shocked, you are now being told that you may have caused the affair by your neglect. A common belief pervasive in our society is that there must have been something wrong between the couple to begin with, that “caused the affair”. The partner discovering the affair can also start to believe that they must be inadequate in some way or their partner would not have had an affair. Now everything gets even more confusing. The reality is that marital dynamics, do not cause affairs. Even a lack of intimacy does not cause an affair. Affairs are a marital partner’s solution to unmet needs, which could be any number of motivators. This could be a need for validation, sexual diversity, or a psychological stimulation. It can even present itself as a need to see if they “still got it”. Even though both partners in a relationship are responsible for the marital climate, it does not follow that if one partner is not getting their needs met that they will just go out and satisfy these unmet needs anyway they want. So even if the partner who has the affair has convinced themselves that their needs are unmet in the marriage, they have skipped one important step: they did not come to their marital partner to express these “unmet needs” and even when they believe they did they often did not do so in a convincing manor, with suggestions that include a request for marital counselling. If every partner in a marriage who had unmet needs had an affair, that would likely cover just about every couple in existence. This rationale is much similar to the alcoholic saying that they “drink because they are not loved” when in fact it is usually the other way around, they are unloved because they drink so much. The affair person, in a similar way, can convince themselves that their partner is letting them down and the other person (the one they have or are having the affair) treats them so much better. A slippery slope as it is often half true the partner having the affair does usually get treated “better” with whoever they are having or had the affair with. The affair partner now enters into a bubble of a sort whereby in the context of the affair they do feel different, usually validated, more affection , things are just generally easier with the other person, leading to a belief that they maybe better off with this other person. Now the affair person has added another dimension to their life that makes it difficult for them to see objectively. So much like a problem drinker they can begin to rationalize the affair, or stay in some form of denial about the relevance of the affair while continuing to conduct a private life.